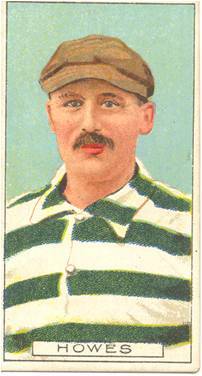 The 1906 Cohen Weenen Cigarette Card Featuring QPR Goalkeeper Arthur Howes. This cigarette card is the fourth in the series and features one of our goalkeepers from the mid-1900’s.Cohen Weenen & Co. was a small tobacco company based in London. They produced their first set of cards in 1901. Then in 1906, Series No.2 of: ‘Owners, Jockeys, Footballers, Cricketers,’ was issued. This set of 50 cards included QPR goalkeeper Arthur Howes. The reverse side of the card reads: ‘Howes, Queen’s Park Rangers, whose goal-keeping has been exceptionally good during the present season (1906-07}’. An auction from November 2010 stated that this card had a catalogue value of ¬£14.00. Arthur Howes was born in Leicester in 1876 and after signing from Brighton& Hove Albion, his previous clubs had included; Leicester Fosse, Reading, Dundee and Dumbarton. He made his R’s debut at Luton Town on 12th November 1904 and went on to make 53 1st team appearances. He was described as ‘alert and agile’, but sadly his career at Rangers came to an abrupt end because he was so severely injured. His last appearance for the R’s was at Reading on 9th March 1907. In fact, he never played in another first class match again. Great to see these old cards. When you see these and the old films of the early years they all look as if they should be drawing their pension! A far cry from the peacocks of today. Great goalkeeping hat to throw on the ball! Do we know if the serious injury was sustained in the match at Reading or car accident etc. I wonder if he survived world war 1?..Maybe civilian injuries prevented him from being conscripted. Catalogue value for single cards of this type?.. thats interesting. I had always thought complete sets dominated. Thank you. I came across this reference by accident. I maintain a non-commercial website dedicated to people named Howes, http://www.howesfamilies.com. Arthur is on there but I had nothing on him after 1891. Will add more in coming days based upon this and other material. A PS to my note above: I have found Arthur Howes in 1901 and 1911 censuses. He worked as a brickie in Dundee in the former, which ties in with your text, and had moved back to Leicester by 1911, also a brickie. I’ve also found the baptism of his second daughter in Hendon in 1906, when his occupation was also listed as Bricklayer. Sadly I have no information on him after 1911.